What you do to relax yourself after the hectic day? I got lot of different answers for this. Some may like to listen to music, some may like to read or some even chooses to go for a long drive. But to my surprise, 90% people answers – ‘Having a hot bath’. It is true that there is no other thing than hot water bath that refreshes you. Even Ayurveda suggests hot water bath for relaxation. Most prefer to have bath in the evening as they want to get rid of odor of sweating. According to skin experts sweating is good for skin health. Waste metabolites are eliminated from body due to sweating. However whatever good for your skin/ body may not be actually good for you. Let me explain you with the help of What’s that smell, Boss? There is another way to get rid of the waste toxins from your body. Just have Hot water bath !!! It’s not all. Here are few more benefits of having a bath with hot water. Hot water bath help to accelerate blood circulation and further helps to relieve our stres. Hot water bath is suggested in diseases like cold, joint pains, back pain and arthritis. Hot water is good for infants as well as for aged persons. Hot water bath helps to open the pores in our skin and boosts your oxytocin levels of skin. It has the same effect while we take steam during facial. However, many of my friends argue me that hot water bath is wastage of water as well as electricity. I believe in reduce, reuse and recycle. I have a great solution for this. We can use shower than having a tube bath. Same way I have a great energy saving option for hot water. Instead of electric heater, solar heater is the perfect eco-friendly and cost effective option. Here is one great eco-friendly choice of Racold water heater. Racold has won “National Energy Conservation Award ” by BEE for four consecutive years. As well the company is also a winner of award “Best Performed Manufacturer on installation of Solar Water Heaters in 2011-12″ by MNRE. Racold is a great green solution for having hydrotherapy. Really kids remember the things they experience ,than what they hear or learn in school. This reminded me the first time when I taken him to native place. Our native is in Raigad district. Our relatives have planted lot of mango trees in his farm. It was around last week of May. The day before we reach our native, there was mild rain shower. The surrounding near our relatives house was filled with mangoes that dropped due to rain. 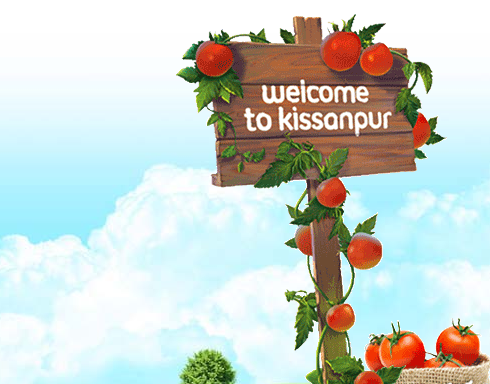 Being a metropolitan resident, we are habituated to see Mangoes in small basket or boxes in the market. For our urban minds mango is very precious. May be he was observing it when we cut it carefully or share it. And, in our native those precious mangoes were sprinkled like flowers. My son was surprised and at the same he was enjoying. We were glad to see his happy face. He started running around the house round,round and round. First he collected as many mangoes as he can collect in his tiny hand. Then he realized, he need basket to collect them. He ran inside the house, taken a basket and started collecting the mangoes. After some time he started asking my uncle, how you have created this “mango carpet” (this was his word for all those plenty mangoes fallen in garden due to rain.) He asked how all mangoes fell at a time, why you are all not collecting it, what will happen to those mangoes if we do not pick them up and …… My uncle was answering him with a smiling face. So…his excited face reminded me the old incidence. As my uncle has answered all his curious questions, now he knows more than me regarding various things related to farming and gardening. He can recognize different trees like Asoka, banyan, neem, guava, jackfruit etc. He even has idea which mangoes are good for pickle and what is the right time to make it. He loves mango murabba , that I make at home. Actually I mix grated raw mango, sugar and keep it in the hot sun. It takes around 8-10 days, to make such murabba. I take a big vessel for it and wrap a soft cotton cloth on the top of it. Every day I open that cloth and mix the mixture and again tie that cloth. He enjoys all the process in those 8-10 days. 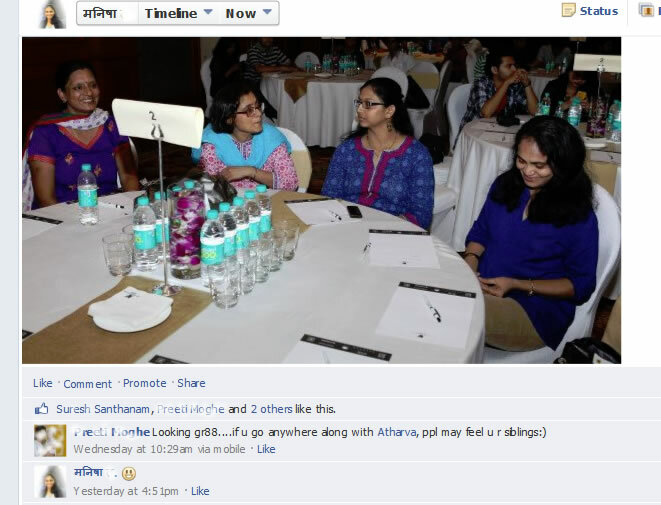 This is all about my first indiblogger meet. The topic was so tempting- Anything under the sun! Yes.. all about our skin protection in summer. 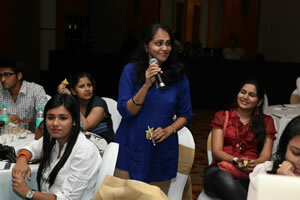 I was so excited to attend this meet at JW Marriott, Mumbai. 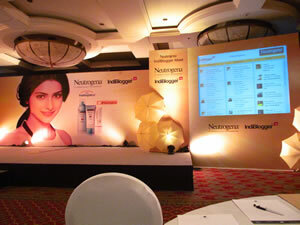 This meet was arranged by Neutrogena , wonderful brand that helps to make skin healthy. When I reached the venue, I just forgot that I am new here as lots of smiling face welcomed me. I met Varsha, Corinne, Zeenat , Anu and Aparna. We all entered the huge hall where we were asked to register. I do not how, but my name was rejected. I was shocked, since I was attending it for first time. However the indi-team helped me and it was successful. The theme was ‘Anything under the sun! And yes I could feel it with yellow umbrellas, yellow balls and various yellow shades everywhere. Then team member gave a cute yellow cocktail umbrella and asked to write our name (which was the part of fun task we enjoyed later) Here, how my friend tested the Fine fairness deep whitening mask. I know how it feels fresh after using it, as I am using it for last few months. Then we had lot of fun with various fun tasks like creating a group, naming ceremony of group, making anthem for group and defending the Balls with Umbrellas. I also enjoyed new dance form – Harlem Shake. But …Sorry, unable to upload video right now! Here is the funny moment …. After high tea, actress and blogger Tara Sharma arrived with yellow dress. She shared her experience how she feels as a actor, mother, TV host and a blogger. 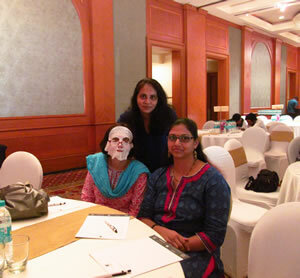 Dr. Parekh made us aware about various facts regarding using the right type of sunscreen. The demo regarding how UV rays affect on our skin was eye opener. I was amazed to know about advanced Helioplex formula of Neutrogena UltraSheer. Helioplex formula works against skin darkening, spots, fine line , dryness and early aging. Don’t believe it ? Here is the proof. My sis said that if I will go out with my son, People will think that we are siblings. Now, I am free to go for swimming under the sun with my Neutrogena products. 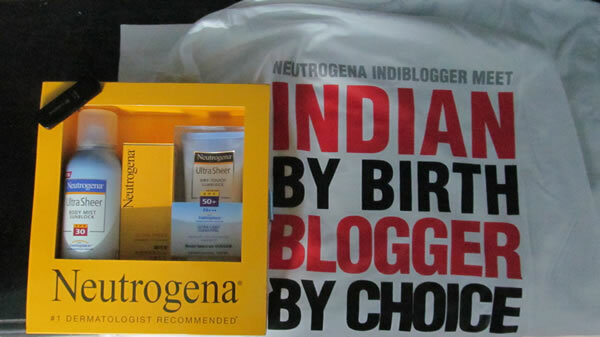 This is my goodie bag from Neutrogena! And Awaiting for next meet….